Waking up with a stiff back or neck can be one of the most frustrating experiences to have to endure. For those who have chronic back and neck pain, this phenomenon occurs more often than not and can drastically affect one’s quality of living. If you’ve been experiencing ongoing back and neck pain, it’s important to see a doctor to make sure there isn’t a more serious condition like a fracture, lesion, or tumor causing your pain. However, if your doctor has run the necessary tests and recommended that you seek a specialist to help relieve your chronic pain, physical therapy may be the best option for you. Physical therapists largely base their treatment plans on stretching and strengthening the muscles around the problem areas in order to relieve pain for their patients. When you see a physical therapist, they will be able to design a specific treatment plan of stretches and strengthening exercises that you will need to stick to in order to start seeing some results. While you will probably practice these exercises in your therapy sessions, you may also be required to perform a stretching and exercise routine on your own as well. • Back stretches – Lying flat on the ground with your arms extended on the floor at a perpendicular angle to your body, bend your left knee and bring it towards your chest. Rotate this knee as far as you can to the right side of your body until you feel a stretch in your lower back. Hold this for ten seconds and then repeat for the other side of your body. Next, sit up with your legs straight out in front of you. Lean forward and try to touch your toes while simultaneously dropping your head to your chest. You should feel the stretch extend from your neck through your lower back. Hold for ten seconds. • Gentle neck stretches – Standing straight with your arms at your side, slowly drop your chin to your chest and hold it as close to your body as you can for ten seconds. Next, look forward and turn your chin until it is aligned with your shoulder. Hold there for ten seconds and then repeat for the other side of your neck as well. Finally, looking forward, try to press your right ear to your right shoulder until you feel a stretch. Hold for five to ten seconds and then repeat for your left side. You may also notice that strengthening your shoulder and trapezius muscles may take some pressure off of your neck muscles. 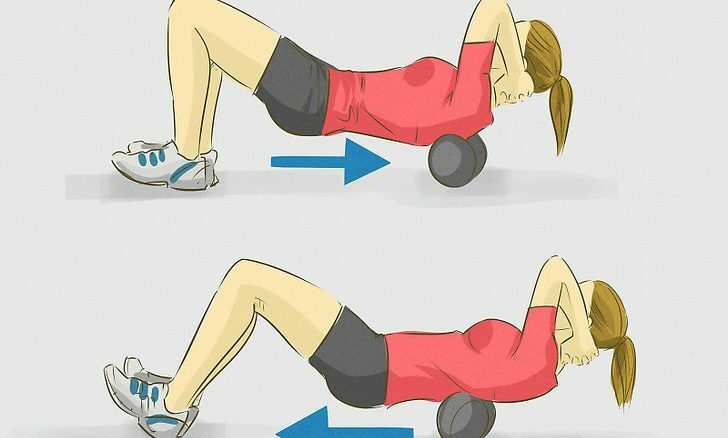 In order to strengthen these muscles, all you need are two dumbbells of the same weight. Standing straight, hold each dumbbell at your side and shrug your shoulder up to your ears. If you can, do three sets of ten repetitions. Once these muscles become stronger, you may notice weight being taken off your neck, which may in turn relieve some of your pain. Taylor Thomas is an experienced writer who has written for a number of notable publications. As a lifestyle expert, Mr. Thomas is able to offer advice and insight on a multitude of topics, including those pertaining to back and neck pain.